San Sebastián -Donostia in the native tongue- is a piece of heaven on earth, with deep blue seas and sandy beaches enveloped by green mountains. This Basque city has become one of Spain's summer city of choice, where they flock for its warm yet bearable temperature. But you can do plenty more than just sunbathing, it also has a cultural life to die for, fantastic restaurants, lively nightlife and beautiful natural surroundings. 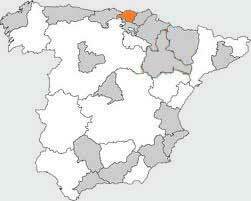 Bilbao, Spainis just 62 miles or 100 kilometers to the west of San Sebastian and is thus easily accessible. You can reach Bilbao by bus, car or train. Bilbao is set amidst a picturesque coast, with stunning green hills to boot. Bilbao’s main attraction is its Old Quarter (Casco Viejo). Gastronomy and shopping come a close second and third. 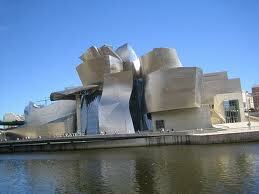 Bilbao is the capital of Vizcaya in the Basque Country and is set on the bank of the Nervion river. Churches: mostly Gothic architecture with some Baroque cathedrals thrown in. 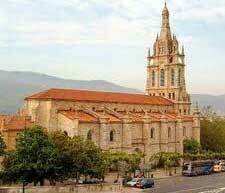 Churches to visit are the Cathedral of St. James, Cathedral of San Anton, Basilica de Begoña, San Nicolas Church, Saint Vincent the Martyr Church. Guggenheim Museum. Thee building in itself is stunning, as its hundreds of titanium squares that remind you of the scales of fish. The Guggenheim is host to a lot of great exhibits, particularly those featuring art work from other Guggenheim collections. Basque Museum. The Basque museum features the Euskadi (Basque Country), its prehistory, ethnography, archaeology and history. Other museums include: The Bullfighting Museum, the Museum of Sacred Art, and the Museum of Artistic Reproductions. Buses from San Sebastian to Bilbao leave in 1-hour intervals. You can also take the EuskoTren, which services the route from San Sebastian to Bilbao. What San Sebastian is part of our collection of our "What" travel guides to countries and / or cities of Spain and Latin America. We provide practical, tourist and cultural information, which allows you to organize your trip. Enjoy and come back up with lots of beautiful memories for life!